The Medical Devices Directive is concerned with all medical devices, from sterile gloves to electronic monitoring equipment and complex MRI-scanners. Directive 93/42/EEC covers the placing on the market and putting into service of Medical Devices within the framework of CE marking. 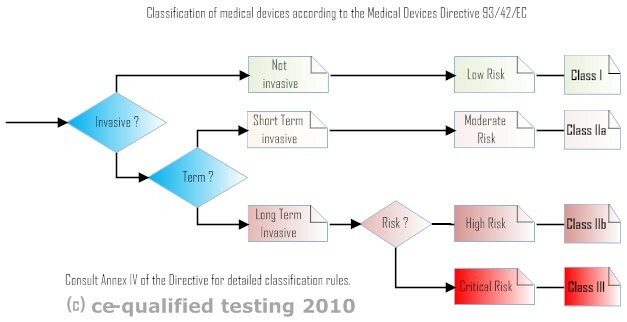 Medical devices are divided into classes I to III, determining the level of required compliance testing. Marking of medical devices is governed by the EN 15223-1:2012 standard. We provide symbol set facilitating the marking of your devices. Medical devices may be classified as Class I, Class IIa, IIb and III, with Class III covering the highest risk products. Medical devices are classified according to two criteria, one being the level of invasiveness , and the the other one is about the accompanying level of risk to the patient. whether or not the device contains a substance. Class I: Non-invasive low risk: Equipment or device without a monitoring function. Class I equipment is not invasive, and should not administer anything to the patient, no medicines nor energy. Class I medical equipment can be approved using the manufacturers declaration (similar to the LV or EMC directive) and no involvement of any certified or notified body is required. Class II : Non-invasive or short time invasive equipment or intensive patient skin contact or administration of body fluids or medicinal fluids or gases. Class II equipment (and up) requires the involvement of a Notified Body that will approve customers documentation and/or QMS. 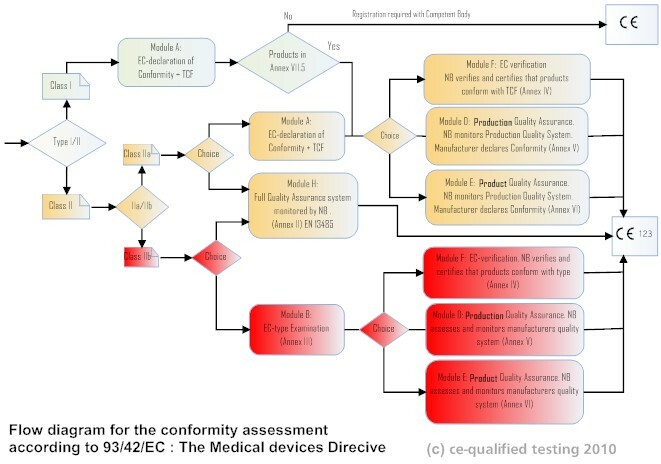 The diagram below shows the conformity assessment modules available as a function of the device class. "ISO 13485: Medical Devices: Quality Management Systems" as their main quality system. The test procedures and judgments are generally steered a by a risk analysis approach. Set up a vigilance system. The compliance of a medical device is an on-going process, that is to be repeated on a regular schedule with as input the residual risk list (as a conclusion of the previous compliance analysis), under consideration of reported field problems and accidents with a view on improvement of the device to maintain or achieve a "state of the art" product. A Technical Construction File (TCF) is mandatory. The full construction details of the equipment and all measures taken to comply to the directive's Essential Requirements must be created and maintained. For all but Class I devices the TCF need approval of an Notified Body. Class I Medical Devices need to be registered at a competent authority. The medical equipment should comply with EN 60601-1-2:2006 and several of the many subparts. The equipment should comply to EN 60601-1:2007 and applicable subparts, depending on the type of device. The EN 60601-1 standard series contains extensive requirements for patient touch current, dielectric testing and single fault requirements. ce-test provides for testing services to this standard. A full risk assessment to ISO 14971:2007 is part of the approval procedure for medical devices. ce-test may perform such a risk assessment according to the FMEA (Failure Mode and Effect Analysis) and a bi-directional TOP-DOWN-TOP FTA (Fault tree Analysis) methods. Other methods are acceptable. Products need to be fully traceable, both at the production stages (where do components come from) and in the marketing stage (to who the products are sold) . ce-test	can help you with the requirements for traceability. The manufacturer needs to set up and maintain a system where accidents and "near accidents" with the device will be adequately reported to the authorities. In combination with the required traceability of the product, this will allow effective product recalls and reduces collateral damage to patients if required. The manufacturer needs to watch for any possible improvement to the safety of the product -to the state of the art-, and implement them in the final product as soon as possible, even after the product has been brought on the market. The list of residual risk should funtion as input to this process. Medical devices need to labeled so as they can be used safely by the addressed customer. This includes a set of warnings and markings for common hazards, such as sterilization warnings, date of use, and other warnings. A number of symbols have been defined in ISO 15223:2007 . The symbols in this harmonized standard may be used on the devices without further textual explanation. As a non-european medical devices manufacturer you will need to establish a EC authorized representative for your products. The name of the EAR (EC REP) needs to be mentioned on your products. The EC REP is a legal entity designated by you to assist in the compliance process, and should be considered as a neutral compliance partner in Europe. Incident reporting and complaint handling within the EC. We strongly advise any Non-European manufacturers of Medical Devices to appoint a independent EAR in Europe. You should not appoint any of your commercial representatives, as the name of the EAR will be mentioned on the product label.